Driving Force is designed for the latest racing game titles for your Xbox One console, plus select titles on your PC. Add Driving Force to your controller selection and you may never want to race with a regular controller again. With dual-motor force feedback, on-wheel controls and responsive pedals, G920 makes racing feel like the real deal. Get more from your console experience. Add realistic steering and pedal action made for the latest Xbox One titles and select titles on PC. Durable solid steel ball bearings in the wheel shaft and stainless steel paddle shifters and pedals are designed for precision driving. Real hand-stitched leather gives you the look, feel and comfortable grip of a true racing wheel. Realistic force effects simulate the feel of tires on the road through every turn and terrain. Anti-backlash helical gearing provides exceptionally smooth, quiet steering action and keeps the wheel and pedals feeling tight for maximum control. The D-pad and console buttons are conveniently located on the wheel for seamless access to racing controls. Semi-automatic paddle shifters give you smooth gear transitions on hairpin turns and straightaways. A separate floor pedal unit enables a more natural body position for driving. Comfortably brake, accelerate and change gears like you would in an actual car. The nonlinear brake pedal mimics the performance of pressure-sensitive brake systems for a more responsive, accurate braking feel. For even greater control, add the optional 6-speed manual Driving Force Shifter* to the G29 or G920 Driving Force Racing Wheel. * Driving Force Shifter is sold separately and not compatible with PS3. 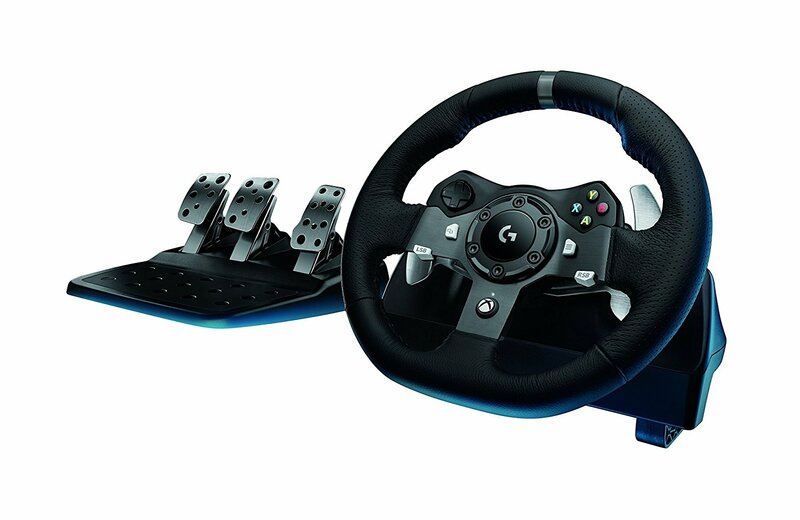 Xbox One, Windows 8.1, Windows 8, or Windows 7 and games that support Logitech force feedback racing wheel.